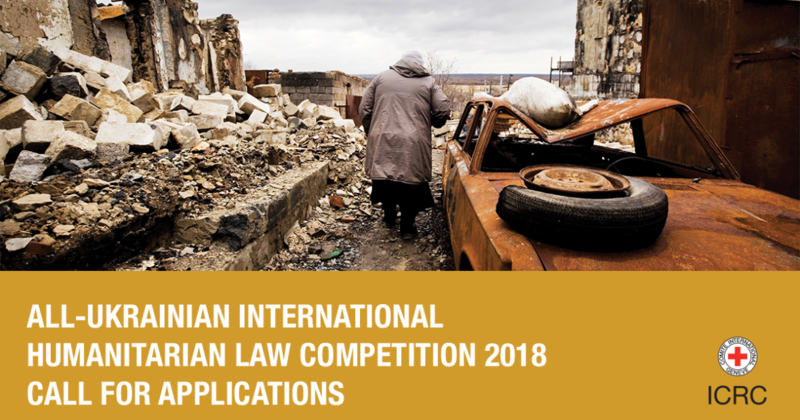 The International Committee of the Red Cross (ICRC) is launching a call for applications for the All-Ukrainian International Humanitarian Law Competition 2018 (Competition) to be held 5-7 December 2018 in Kyiv. The Competition is a three-day event composed of a number of simulations performed by students’ teams, as well as an introductory workshop by international humanitarian law (IHL) experts and practitioners. The Competition will put the participants in the roles of humanitarian law practitioners to address simulated situations of an armed conflict with the aim to test their knowledge of IHL and public international law, as well as their ability to present, advocate for, and defend legal positions of various actors. Each law school in Ukraine is invited to nominate one team of three law students to participate in the Competition. Coaches can’t be a member of the team. PhD students are not eligible. Interested teams shall complete the Application Package, which includes Registration Form, Statement of Interest, and short answers to 3 Selection Questions requiring legal analysis. Applications will be accepted by 23:59 pm (Kyiv time) on 14 October 2018. Teams are encouraged to submit their application packages as soon as possible. The Application Packages will be anonymized by numerical values and evaluated by the Competition Committee. The selection results and participation invitations for accepted teams will be sent by 19 October 2018. Working language of the Competition – Ukrainian. More information on Competition is available in Ukrainian.